Hal and Sal are now independent and the peregrines are no longer frequenting the nest ledge. Watch for the Hamilton Webcam to be reactivated sometime in the future. More details can be found on the Hamilton home page and the news page. Peregrine falcons still need YOUR help! 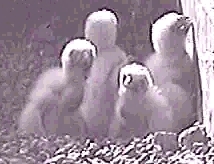 A scene from the webcam shortly after the chicks hatched in 2000.